Police have arrested the owner of the bus that was involved in a fatal road accident in Kericho on Wednesday morning. Bernard Ishindu Shitiabayi, the owner of the bus christened Home Boyz and operated by the Western Cross Express Sacco, was arrested in Kakamega on Wednesday evening. He was arrested alongside Cleophas Shimanyula alias Toto, who is a member and key player of Western Cross Express Sacco. Confirming the arrests, Kericho County Police Commander James Mogera said the two were detained at Kakamega Central police station. The morning crash which occurred at around 5 am has claimed the lives of 55 people- 9 children, 15 women, 31 men. Reports indicate that the Kakamega-bound bus was overloaded and speeding when the accident occurred on the Kisumu-Muhoroni highway. 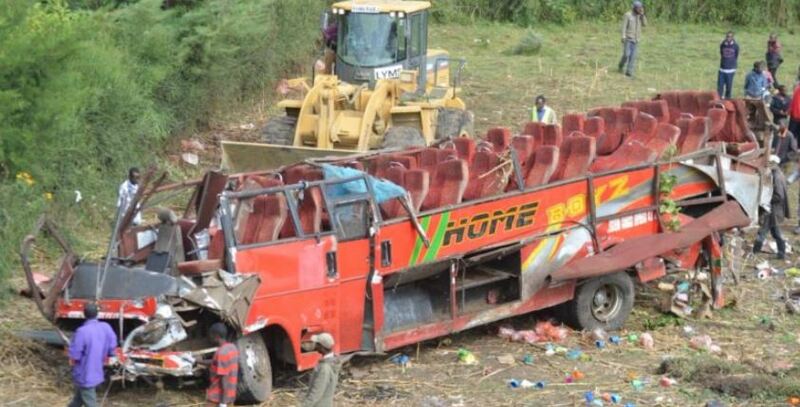 The National Transport and Safety Authority (NTSA) has also revealed that the bus was not licensed to operate at night. “This vehicle had no licence to transport passengers at night and the owners will have to take responsibility,” NTSA Director-General Meja said. “They will face the law and we will take them to court to answer to charges,” he said. Meja further faulted a Court decision to lift the ban on night travel for public transport buses. “If you look at the data we have, most accidents happen at night and we wanted to stop that. But we had no choice when the court directed we reverse the policy,” he said. President Uhuru Kenyatta has called on drivers to exercise caution on roads. “As authorities investigate the cause of the accident with a view of taking action, I would like to remind drivers to always exercise caution to avoid such catastrophic incidents”, he said on his Twitter handle.